When I was a student, I really enjoyed participating in workshops and building projects. I learnt a lot of things in a very interesting way while doing workshops. Now, I am working in a company which is India’s Biggest in providing workshops and I am very happy to see how much impact we are creating in the lives of students through high quality workshops. As part of my job, I interact with a lot of faculty and student organizers from all over the country. I, and my team members, have had numerous conversations with senior faculties, HODs, Deans and Principals of engineering colleges all over India. Our CEO is on the board of studies of few colleges and also contributed to an AICTE paper on Curriculum Design and he has interacted with even larger number of people from academia. From our experience, although faculty and students all over the country know the importance of practical learning, they often face a number of challenges implementing it and conducting great workshops. Many of them did it in the wrong way in the past, worked with second grade companies and had a bitter experience. The biggest challenge is in the first step - selecting the right topic for Electronics Workshops. If we select a too complex Electronics topic, students (especially in 1-2 years) might not learn well, select something too easy and students get bored and feel not challenging enough. So we need to select the right topic. If possible – conduct multiple workshops for 1st, 2nd and 3rd year students with varying complexity so all of them will have a great experience. Also keep the workshop topic closer to real-life problem statement so that students understand that they are learning to use technology to solve a problem. I am listing below some good Electronics Workshops topics which students found useful and for which we got great feedback from faculty. This particular project is actually a solution to a real-life problem which results in a number of accidents all over the world. We have been hearing lot of news lately regarding the number of people losing lives, vehicles getting into accident at the unmanned railway gates etc. By doing this electronics workshop you will be able to design an efficient solution for the real-life problem statement. 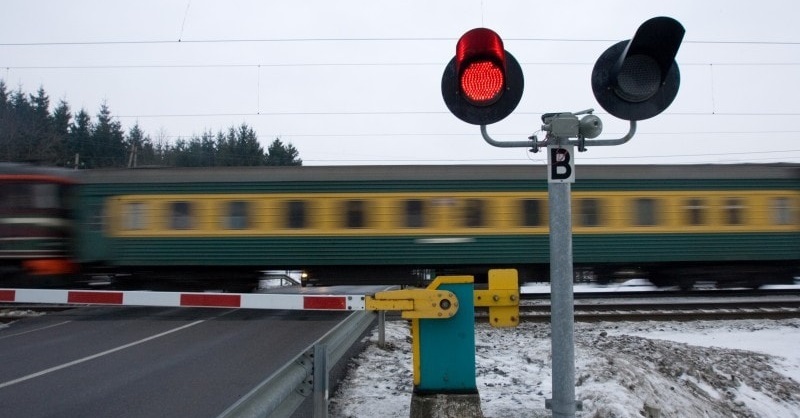 You will practically learn the concepts behind the Embedded Systems, IR sensors working & calibrations and also microcontroller programming during the workshop and build a device that can be used to automatically open/ close the railway gates. This course is ideal for 2nd year electronics students who are just learning or about to learn microcontroller. It will show them how important it is and how it can be used in real life. This gives them a motivation to do the course well and understand it well. Animatronics hand project is an application of mechatronics technology and it is being widely used in industries to mimic the action of animals and human through electronic devices. You will practically learn to build an animatronic hand that can mimic the actions of the wearer. You will also learn the concepts behind Animatronics, Flux sensor calibrations and working of servo motors during the workshop. This electronics workshop is recommended to 3rd year students who wants to learn and experience a new technology, as mechatronics is an upcoming technology students will find this both interesting and as well as useful. From logistics service to tracking your taxi/ bus, all of these use GPS technology to pinpoint the location. Knowing this technology will help you to develop skills on them and build more innovative projects when you progress in your career. You will practically learn to build an electronic device that can be used to track any vehicle that it attached to and you will also learn the concepts behind GPS & GSM technology, Arduino Architecture & its programming. This electronics workshop will be ideal for 3rd & 4th year students who needs to know various technologies, so that they can use the skill gained to build innovative engineering projects. Arduino Uno -Acts as the brain of the system and controls the process. Internet of Things (IoT) is an upcoming technology which is going to revolutionize all the electronic gadgets that we see today in the coming years. By attending this workshop you will practically learn about the concepts behind Internet of Things (IoT), WiFi communication, Arduino Architecture and its programming. You will be guided to build an electronic device that can detect the moisture variation in the soil and can switch On/ Off based on a threshold value. As this is an upcoming technology and not really included in the curriculum, students pursuing 2nd & 3rd year can undergo the training for better understanding of this technology. The project that you will build during the workshop is an application of Internet of Things (IoT). Reports states that the IoT Technology is going to transform into a multi-trillion dollar market and more than 50 billion devices will be connected to Internet using this technology by 2020. So building projects on this technology will help you to understand it better. By attending this workshop you will practically learn about the concepts behind Internet of Things (IoT), WiFi communication, Sensor calibration and Arduino Architecture. This course is ideal for 2nd & 3rd years who will be learning or already learnt about the microprocessors, as Arduino is an open source microcontroller students will be able to understand the theoretical concepts by building projects on it. Robotics is being widely adapted in the industries of today to increase their operational efficiency. 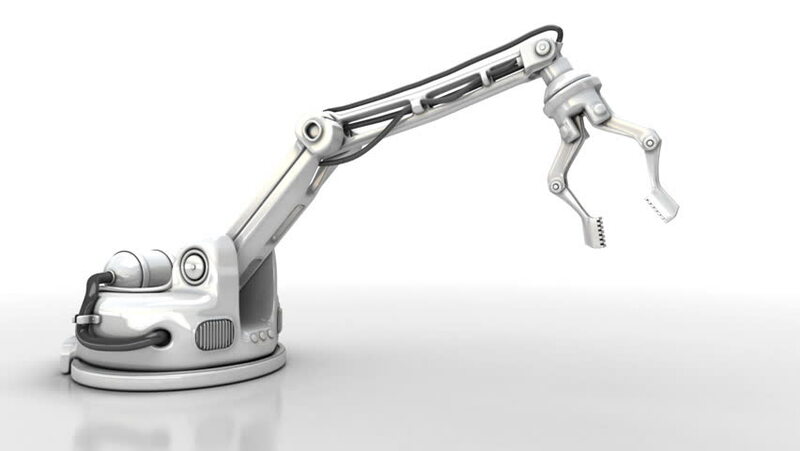 Robotic arm is one such mechatronics application that can operate autonomously to handle the industrial process that needs more physical effort/ contagious in nature. By attending this workshop you will practically learn about the concepts behind the Mechatronics, Accelerometer sensors, Servo motors, Arduino Architecture & its programming and build a robotic arm that can do the action of Pick/ Place controlled by hand gestures. Students pursuing 3rd & 4th year should attend this course to get hands-on experience on Mechatronics to improve their multi-disciplinary core engineering skills. The LED displays that we see at different locations like Railway Stations, Bus Stands, Markets etc., is an application of this project itself. You will practically learn to build a LED based POV display using an Arduino that can display the programmed letters by the action of high rpm motors. This course will be ideal for 2nd year students who just entered the department and can get an overview of the microcontroller and its programming and use the skills to develop good mini projects. RFID is a technology that is used for exchanging information wirelessly with the use of electromagnetic fields. The application of this technology is endless, from authentication system for security purpose to authentication in Toll-gates. You will practically learn to build an electronic device that will be integrated with a RFID module that can scan the RFID tags and facilitates the authentication process. This electronics workshop will be ideal for 4th year engineering students as they will be studying about wireless communication and can use the skills to build innovative engineering projects. Biometric devices are employed for the highest level of security as they involve the scanning of biological organs like eyes, fingers, etc. By doing this electronics workshop you will learn to build an electronic device that will have a bio-metric scanner that can identify the pattern of the organ and a processing unit, which compares them with pre-stored values for allowing access. This course will be ideal for 3rd year engineering students as they will be learning more about the authentication and automation technologies in their curriculum. Wearable Technologies are devices which can be worn by the user & simultaneously process and display relevant information on the wearer. 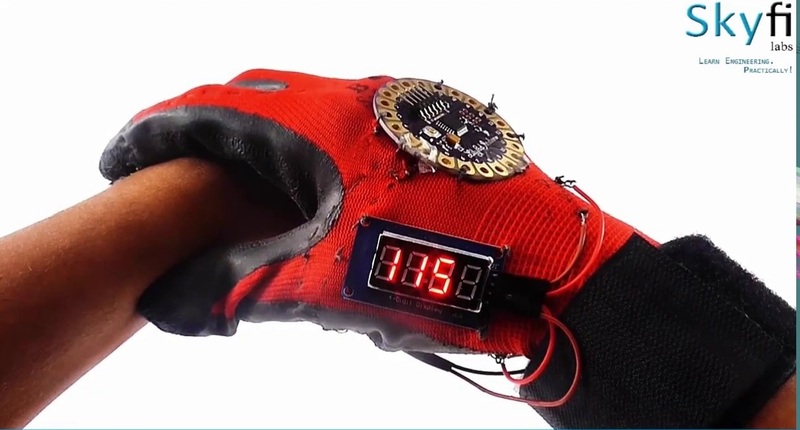 You will practically learn to build a wearable glove that will be integrated with a pulse sensor, which can be used to get the pulse value of any individual. By doing this workshop you will practically understand the concepts behind Wearables, Lilypad Arduino Architecture & its programming and Pulse sensor calibration. This electronics workshop is recommended to final year electronics students as need to know about the upcoming technologies to develop their core skills before their placement drives. 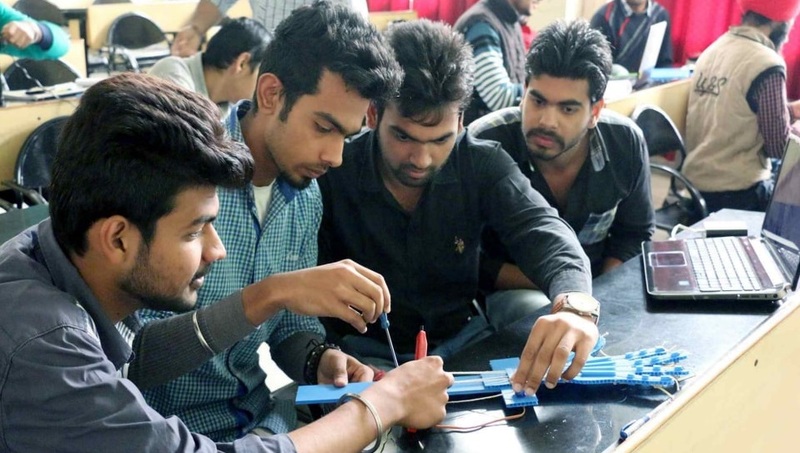 In case you are interested to attend a electronics workshop but not able to find one, you can conduct a electronics workshop in your college itself in association with Skyfi Labs. 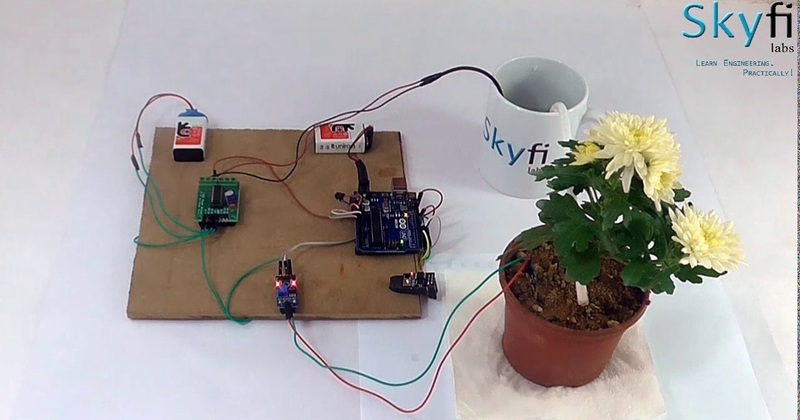 We at Skyfi Labs have developed some amazing hands-on training programs that helps you to learn and build electronics projects in the most simplest way. Our team will be coming to your college upon inviting along with the kits and necessary material and help you to build electronics projects practically. The Innovative learning methodology which we follow not only helps you to build electronics projects but ensures you are learning while doing so. In case you are interested to learn and build the electronics project at your home itself, you can enroll for our online courses and build the project from any part of the Earth.